Stems: 1-several, 0 to 4.8 inches long, outer prostrate or decumbent, inner nearly erect. Leaves: Alternate, odd-pinnately compound, 4/5 to 5 inches long; leaflets mostly 7-17, elliptic, oblong, or lanceolate1/6 to 3/5 inch long, 1/18 to 1/4 inch wide, variously gray-pubescent, lower surface usually paler and more densely pubescent than upper; base pointed or rounded; tip rounded or pointed; stipules lanceolate, 1/12 to 1/3 inch long, distinct. Inflorescences: Flowers of two kinds; regular flowers in heads; heads dense, ovoid to round, 3-17-flowered; stalks slender, 1.2 to 4.8 inches long; inconspicuous, self-pollinating flowers borne 1-5 together on short stalks at plant base. The two flower types are not generally produced on the same plant. Flowers: Short-stalked; calyx bell-shaped or very short-tubular, 1/12 to 1/4 inch long, teeth long-tapering; corollas 1/3 to 3/5 inch long, greenish-white to yellowish or purplish, sometimes purple-veined or tips purple; banner petal strongly bent backwards; stamens 10, 9 united, 1 free; inconspicuous flowers about 1/6 to 1/4 inch long, petals often shorter than calyx teeth. Fruits: Pods, prostrate to ascending, similar in both flower types, oblong-ellipsoid or spindle-shaped, mostly .5 to 1.2 inch long, 1/5 to 1/3 inch wide, variously pubescent; seeds somewhat heart-shaped, 1/16 to 1/10 inch long, irregularly pitted, brownish, sometimes purple-spotted. Habitat: Rocky or sandy prairie hillsides, bluffs, canyons, roadsides, waste areas, pond and lake shores; variety of soils. 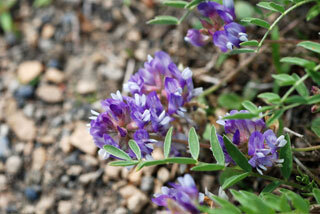 Comments: Low milkvetch is a highly variable species. It may be loosely or densely tufted.